Following some recent comments and questions and in the absence of any completed projects, I'd planned today's post on wearing shawls. I was going to use my Boneyard for demonstration purposes. After half an hour of hunting, I must conclude it has disappeared (probably into one of my many handbags). While searching, I realised that my storage place for small projects hasn't ever made it to the blog, and it seemed like a good time to remedy that. The case was a gift from my mum - we spotted it one day while mooching around The Cornstore, although she looked quite bemused that such a small old thing would be very useful. It's in pretty good condition although there are tell-tale signs of age on the handles and the inside might benefit from a make-over. The initials S.J.S. are written inside, and I often wonder who S.J.S. is (was?) 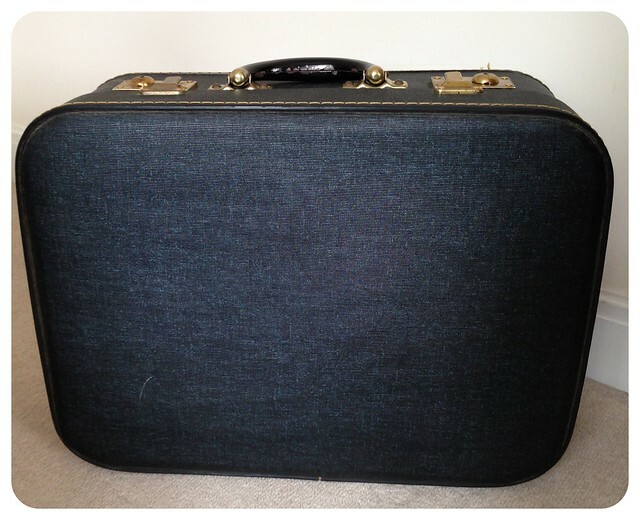 and where they took the case - what memories would it hold for them? The unknown history is one of the things I love about vintage finds. Would you care to see what's inside? There is *just* enough space for 21 small projects at the moment - mainly shawls - but I might need to consider new options by the time Boneyard turns up and my current WIPs are finished. You can't see them all in this messy pile, but it gives you a flavour. It doesn't look like much considering the hours of enjoyment (and several of frustration) that were spent making them, but each one is special for a different reason, including what was happening when I was working on them (a holiday, a Royal wedding, chatting at the park), some are from yarn I bought on great days out, and some remind me of times they were worn. 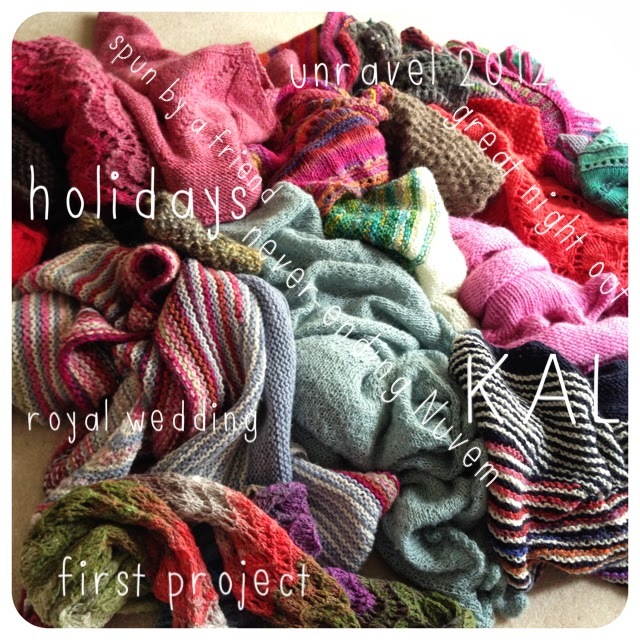 They are not just shawls to me - they hold a lot of memories. That's one of the things I love about handknits. When Boneyard turns up, I'll get the planned post finished. Thanks for popping in today - I hope you all have a lovely weekend... whatever the weather! LOL! Wat a find. This happens to me where I put stuff somewhere and forget about it.